Obstructed total anomalous pulmonary venous drainage (TAPVD) is a rare occurrence of congenital heart disease that increases the morbidity and mortality of surgical repair. Darling et al. proposed a classification that is widely followed and consists of four types: Supracardiac (55%), cardiac (30%), infracardiac (13%), and mixed (2-5%). TAPVD can further be classified by the presence or absence of obstruction. Obstructed TAPVD more commonly occurs in the infracardiac types as compared to the supracardiac types. In supracardiac TAPVD, there is a common chamber located posterior to the left atrium that forms the confluence of the pulmonary veins. From this confluence, a vertical vein courses superiorly to communicate with the systemic venous system, draining blood into the right heart chambers. The vertical vein can be obstructed as it runs its course within a very confined space that houses the ipsilateral pulmonary artery anteriorly and the bronchus and descending aorta posteriorly, forming what is known as the bronchogenic vice. Relief of such obstruction is best done surgically where the confluence is communicated to the left atrium and the vertical vein ligated, either totally or partially. However, in instances where such an option is not possible or available, stenting of the vertical vein can be offered as a bridge before the total repair of TAPVD is done. Stenting of the vertical vein in obstructed TAPVD is not a well-established procedure; but anecdotal case reports have shown satisfactory outcome., We report a low weight child with obstructed supracardiac TAPVD, complicated with large omphalocele being palliated via endovascular stenting of the vertical vein via the internal jugular approach. 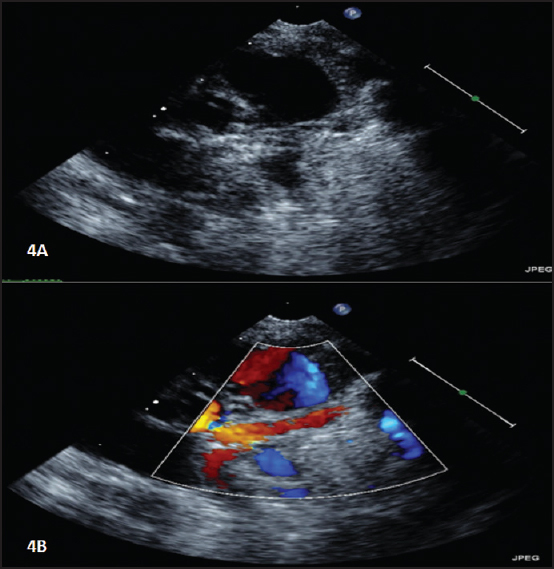 A small-for-gestational-age baby with the birthweight of 1.7 kg was diagnosed to have an omphalocele with concomitant supracardiac TAPVD, secundum atrial septal defect, and patent ductus arteriosus. As the child was still low in weight with unobstructed TAPVD and a large omphalocele, she was treated medically. Upon review, 1 month later, she was noted to be in severe pulmonary hypertension. The vertical vein connecting the pulmonary venous confluence to the innominate vein was noted to be obstructed as it coursed posterior to the left pulmonary artery [Figure 1]. As the child was only 1.9 kg at that time, surgical repair for a low weight child with a large omphalocele was deemed very high-risk. A decision was then made to stent the vertical duct as a bridge to corrective surgery. The initial plan was to stent the vertical vein from the femoral vein to avoid placing a relatively large sheath into a small internal jugular vein. The femoral vein was successfully cannulated, but the guidewire could not be advanced into the inferior vena cava. Angiogram of the femoral vessel showed absence of femoral veins, bilaterally. Lower limb venous drainage to the heart was via the azygos, hemiazygos, and the ductus venosus [Figure 2]. The right internal jugular vein (RIJ) was then cannulated and a 5-French short sheath was inserted. From the RIJ vein, a 4-French Judkins Right (Cordis Corporation, FL, USA) catheter was advanced via the innominate vein into the vertical vein. Vertical vein angiogram showed a discrete anteroposterior compression of the vertical vein at the level of left pulmonary artery, in keeping with the findings on the echocardiogram. The waist measured 1.3 mm while the adjacent segment of the vertical veins was 4 mm wide. With the aid of a Judkins Right coronary artery catheter, a small 0.3556 mm balance middleweight guidewire (Abbott Laboratories, IL, USA) was negotiated into the vertical vein and parked deep into the right lower pulmonary vein. An avant-garde coronary stent size 4.5 mm × 16 mm (Alvimedica, Istanbul, Turkey), was positioned in the stenotic vertical vein. On inflation of the balloon, the stent migrated distally toward the pulmonary vein and the stenotic segment was not adequately addressed. Therefore, a second avant-garde coronary stent size 4.5 mm × 10 mm (Alvimedica, Istanbul, Turkey), was deployed, overlapping the first stent to cover the stenotic segment. 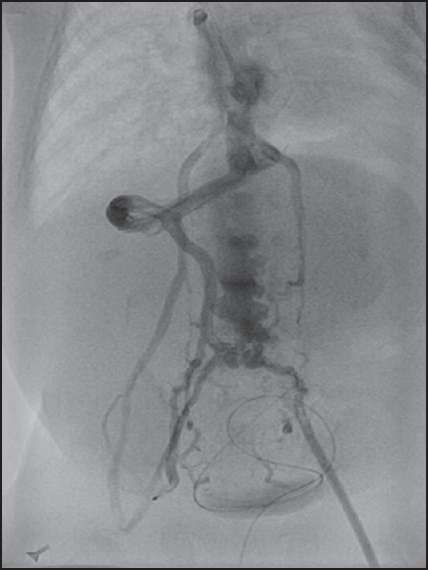 After stenting, angiogram showed that the stenotic segment of the vertical vein was adequately relieved [Figure 3]. Before procedure, the saturation was Saturation of Peripheral Oxygen (SpO2): 41% in 100% oxygen. After procedure, the saturation improved to SpO2: 74%. The patient was hemodynamically stable and was transferred to the pediatric intensive care unit for the continuation of care. There was no facial edema and recovery was uneventful. Echocardiography showed a good stent position with no residual stenosis at the vertical vein [Figure 4]. The right ventricular systolic pressure was estimated to be 30 mmHg on echocardiography. She was transferred back to the referred hospital while awaiting weight gain and spontaneous epithelialization of the omphalocele before the eventual corrective surgery. Unfortunately, the patient succumbed due to a chest infection before corrective surgery could be attempted. Obstructed TAPVD requires urgent surgery and the presence of an omphalocele in this low birthweight infant complicated postoperative management precluding peritoneal dialysis. Initially, the vertical vein was patent but subsequently, there was spontaneous vertical vein obstruction that may be secondary to intimal proliferation. Previous pathological study has shown that the absence of myocardial musculature in the pulmonary vein may be responsible for pulmonary vein stenosis  but this is not readily demonstrable in our patient. Undoubtedly, early corrective surgery is the gold standard in managing obstructed supracardiac TAPVD. However, when corrective surgery is deemed high-risk , or not possible or unavailable, palliative endovascular stenting of the obstructed vertical vein is an option for consideration. The smallest infant weighing 1.4 kg had vertical vein stenting performed via the femoral vein. However, omphalocele associated absent femoral veins obviates such an approach. Hepatic vein was a good alternative route but was obscured by the presence of the omphalocele. RIJ was, therefore, cannulated with care being taken not to advance the short sheath too far while monitoring the insertion process via fluoroscopy. This was to prevent injury to the delicate systemic veins in a small baby. After procedure, the neck vein was not engorged and no signs of superior vena cava obstruction were noted. Transcatheter palliative stenting of the vertical vein effectively acts as a bridge before total correction of the total anomalous pulmonary venous drainage. This report highlights the feasibility and effectiveness of transcatheter palliative stenting of the vertical vein for obstructed supracardiac TAPVD via the internal jugular vein, even in a very small child. Craig JM, Darling RC, Rothney WB. Total pulmonary venous drainage into the right side of the heart; report of 17 autopsied cases not associated with other major cardiovascular anomalies. Lab Invest 1957;6:44-64. Kyser JP, Bengur AR, Siwik ES. 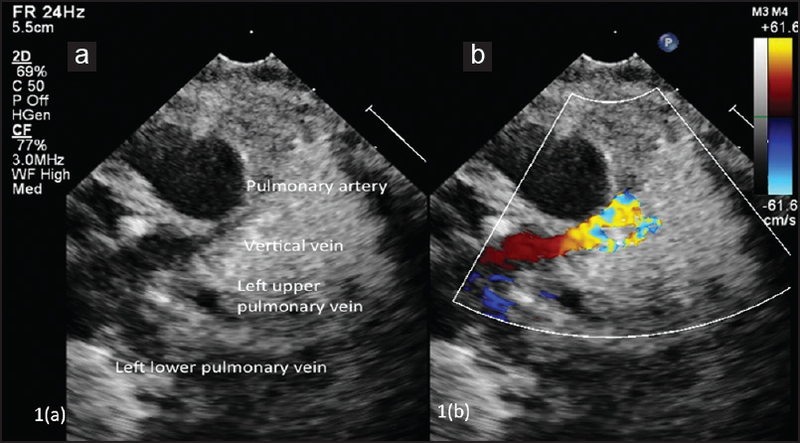 Preoperative palliation of newborn obstructed total anomalous pulmonary venous connection by endovascular stent placement. Catheter Cardiovasc Interv 2006;67:473-6. Lim WK, Wong NL, Tan SK. Emergency stenting of vertical vein in a neonate with obstructed supracardiac total anomalous pulmonary venous drainage. Med J Malaysia 2014;69:138-9. Douglas YL, Jongbloed MR, den Hartog WC, Bartelings MM, Bogers AJ, Ebels T, et al. Pulmonary vein and atrial wall pathology in human total anomalous pulmonary venous connection. Int J Cardiol 2009;134:302-12. Yong MS, d'Udekem YD, Roberton T, Horton S, Dronavalli M, Brizard C, et al. Outcomes of surgery for simple total anomalous pulmonary venous drainage in neonates. Ann Thorac Surg 2011;91:1921-7. 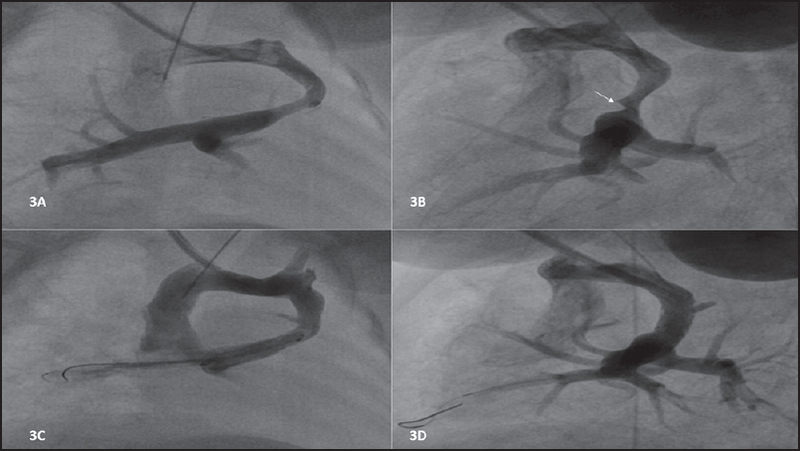 Kobayashi D, Forbes TJ, Aggarwal S. Palliative stent placement in vertical vein in a 1.4 kg infant with obstructed supracardiac total anomalous pulmonary venous connection. Catheter Cardiovasc Interv 2013; 82:574-80.